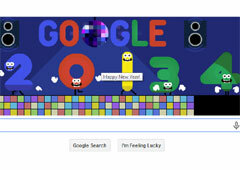 The doodle with a resemblance of discotheque, has the word Google placed on top. This time, Google has played with its second ‘O’ depicting its as a rotating disco light. Two speakers have been placed to both sides of the word as if loud music is ready to farewell the year 2013 and welcome 2014. On the dancing floor are the numbers of 2013 dancing to the music. Towards the right side is number 4 watching the dance & quietly awaiting its turn to replace number 3 as the year 2014 approaches. Though the latest Google doodle looks interactive with disco light & speakers, we tried various browsers and we couldn’t get the doodle to play any music. It only takes you to show Google search results for New Year’s Eve 2013.